From parties to costumes and decorations to the high seas, I’ve pulled together the ultimate Disney Halloween guide so you can celebrate in the parks, on the ocean, or at home! Holidays are so much fun when Disney gets involved. And y’all know I love Disney just about any way I can get it, but there’s something special about celebrating a holiday Disney style. And a Disney Halloween might just be my favorite! I’ve been to Mickey’s Not-So-Scary Halloween Party several times over the past few years, worn my share of Disney Halloween costumes, sailed on a Disney Halloween cruise and of course, decorated my home with everyone’s favorite mouse. One might say, I’m a fan. If you’re looking for all the Disney Halloween tips and lots of fun, you’ve come to the right place. First stop, Disney Parks! 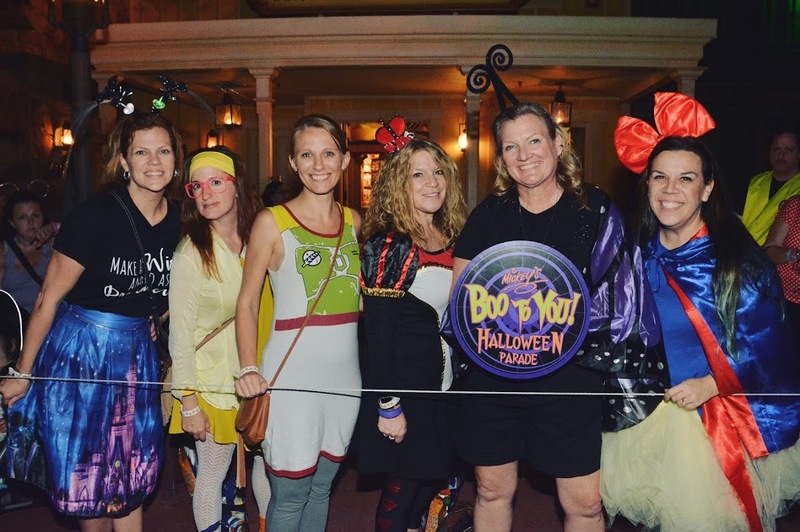 Disney Halloween parties are specially ticketed events, which means there are fewer people in the parks on party nights and a few fun and festive extras. 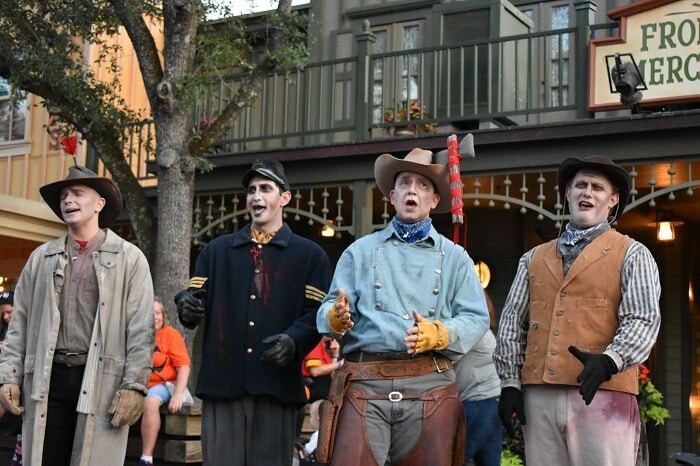 You’ll find Halloween parties at Walt Disney World and Disneyland. 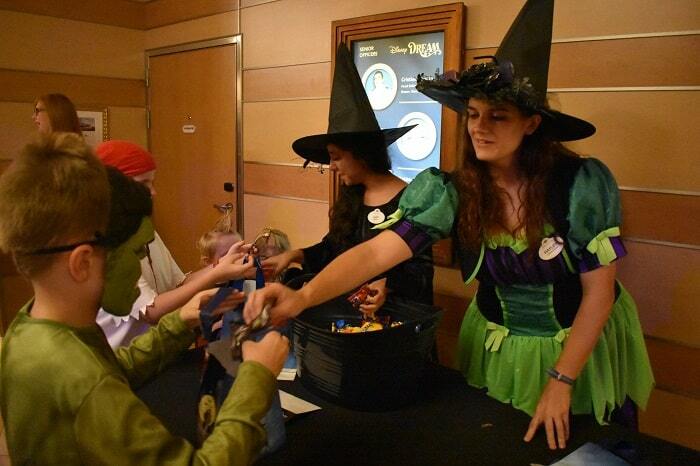 And if you book a Halloween on the High Seas cruise with Disney Cruise Line, you can even trick-or-treat at sea! 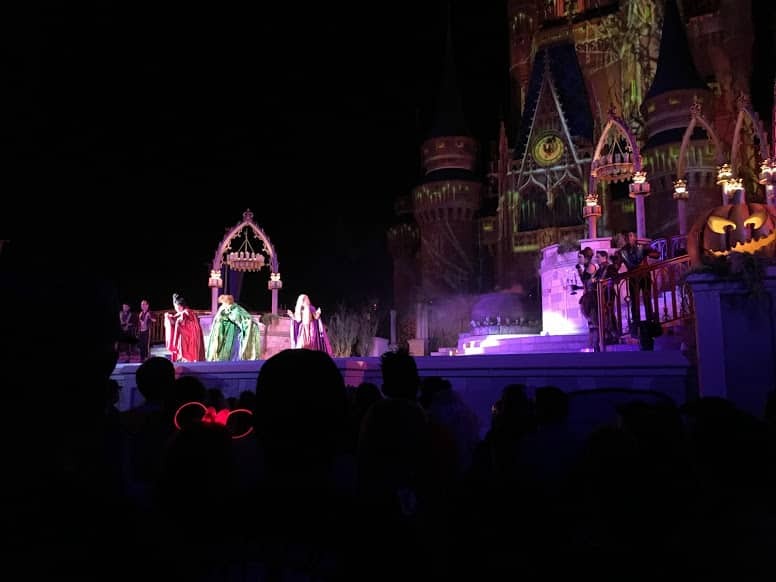 I have the most experience with Mickey’s Not-So-Scary Halloween Party. 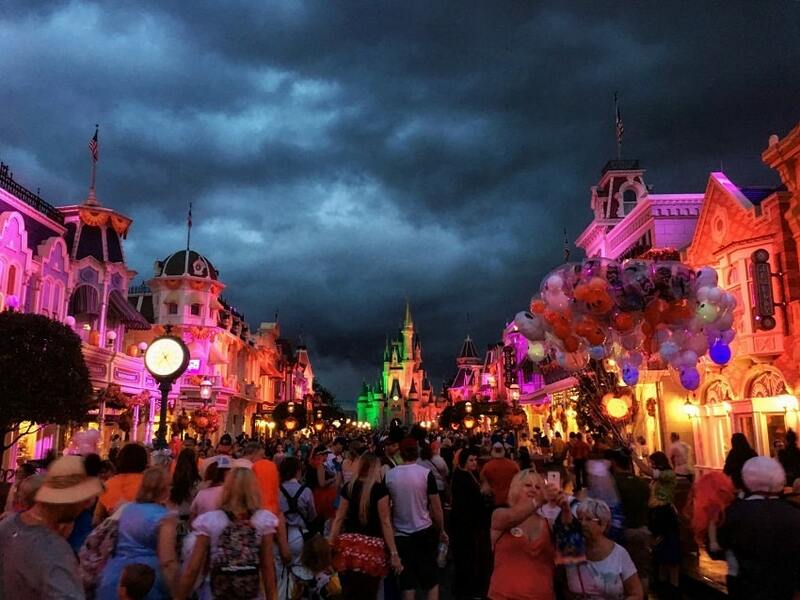 Located in Walt Disney World Resort in Florida, the Halloween party is really the first kick-off of a very festive season that starts with Halloween and ends with New Years Eve. It’s probably my favorite time of year in the parks. 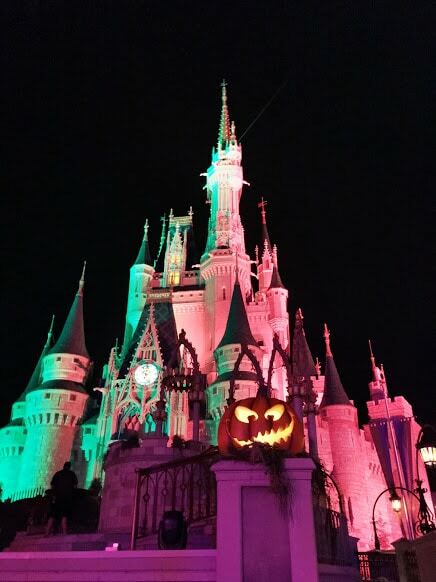 At Mickey’s Not-So-Scary Halloween Party, you can enter the park as early as 4pm with a party ticket (new this year Disney Vacation Club members can enter as early as 2pm) and party into the wee hours of the night. The park closes to the general public at 7pm and that is the official start time of the party, which lasts until midnight. 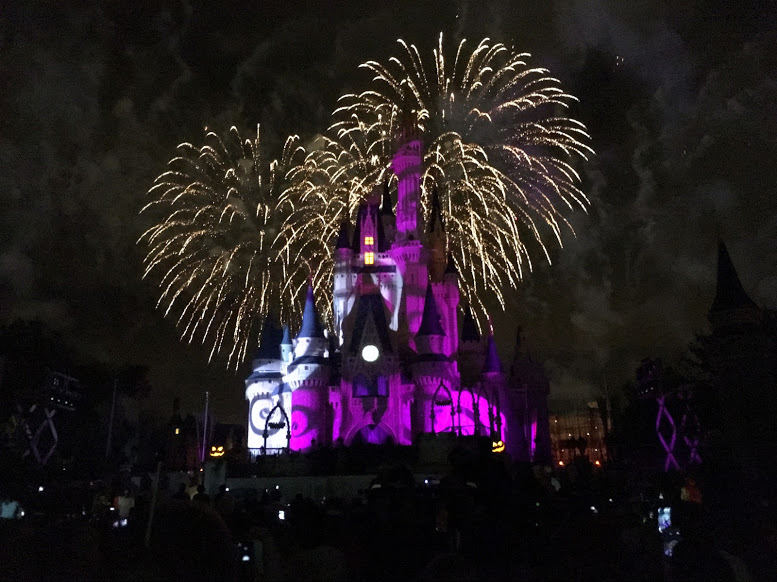 You’ll be able to trick-or-treat, dance with characters in costume, take lots of fun photos, enjoy the parade and of course, fireworks! And if you ask me, the Halloween fireworks at Disney are the best of the entire year. The music is so fun and the colors are vibrant. The show is a must see for sure. 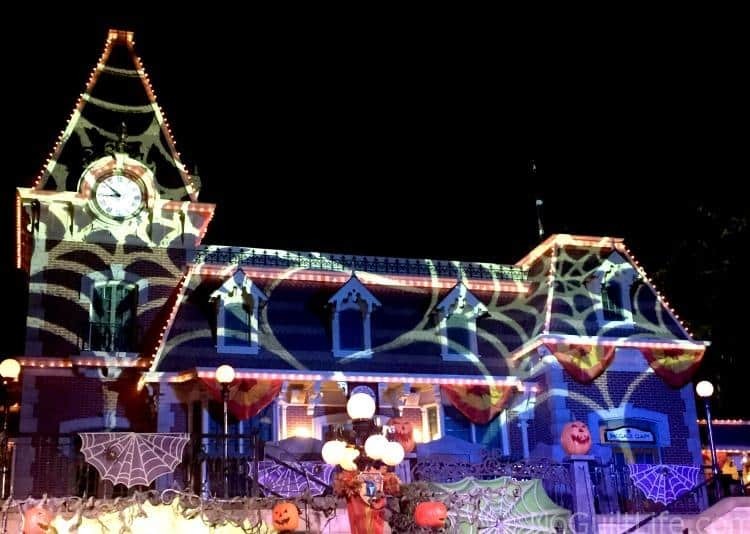 Mickey’s Not-So-Scary Halloween Party has so many opportunities for fun, it will be hard to fit them all in. My tips for making the most of the party are to arrive as early as your ticket allows, eat an early dinner and catch a few rides. Before the party starts, hop in line for the top character photo you hope to get while lighting is still good and lines aren’t too crazy. In past years, the Jack Skellington and 7 Dwarfs photo ops have had the longest lines so people tend to get those out of the way first. TIP: If you don’t want to be in line all night, I would pick one between these two and focus on 0ther things for the rest of the party. There are plenty of photo ops throughout the night and every year it seems like they are adding more magic shots, so make sure you ask your Disney PhotoPass photographer if they have any available. 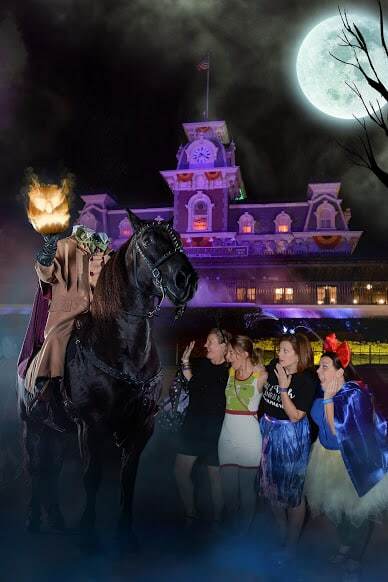 This Headless Horseman op is outside the entrance of the park after you go through the ticket tapstyles. 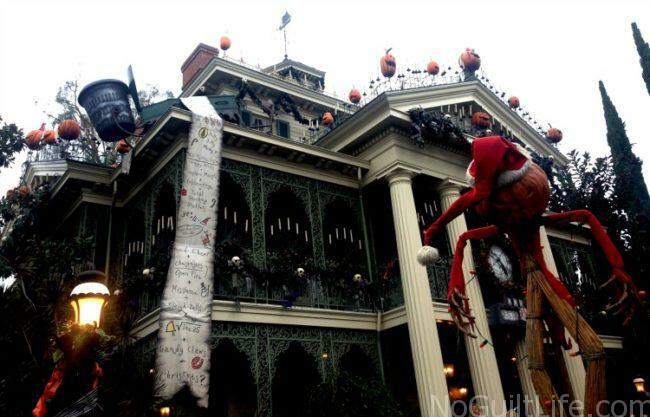 Tickets for Mickey’s Not-So-Scary Halloween Party start at $85 and vary depending on the night. Parties run on select nights from August-October. For party tips, Disneyland style, I went to my friend and fellow Disney superfan, Patty. If you need Disneyland tips, she is your lady! Coincidentally, if you need Disneyland trips, she is also your lady with her killer Travel Agent skills. 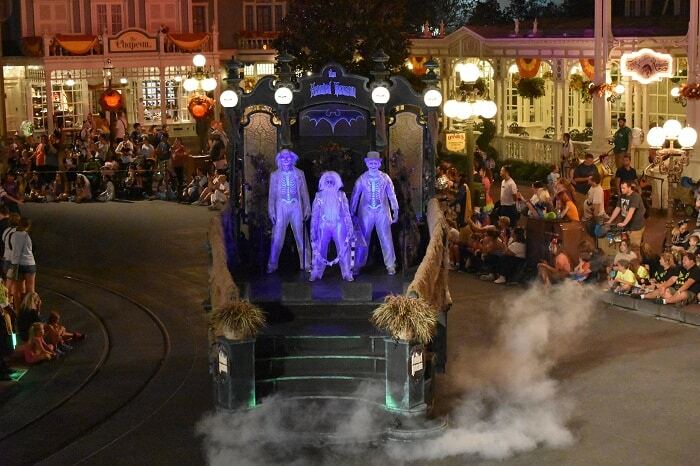 At Disneyland, you’ll find Mickey’s Halloween Party and Haul-O-Ween at Cars Land in Disney California Adventure. Like its counterpart at Walt Disney World, Mickey’s Halloween Party at Disneyland is a separately ticketed event with trick-or treating, spooky(ish) decorations and lots of villains. Patty recommends checking out the rides early on and skipping Toontown due to crowds and difficulty getting around that section of the park. She got stuck in Toontown and it was bad. Don’t be like Patty. Heed her warning. Space Mountain and Haunted Mansion get amazing overlays for Halloween and I’m not jealous at all. 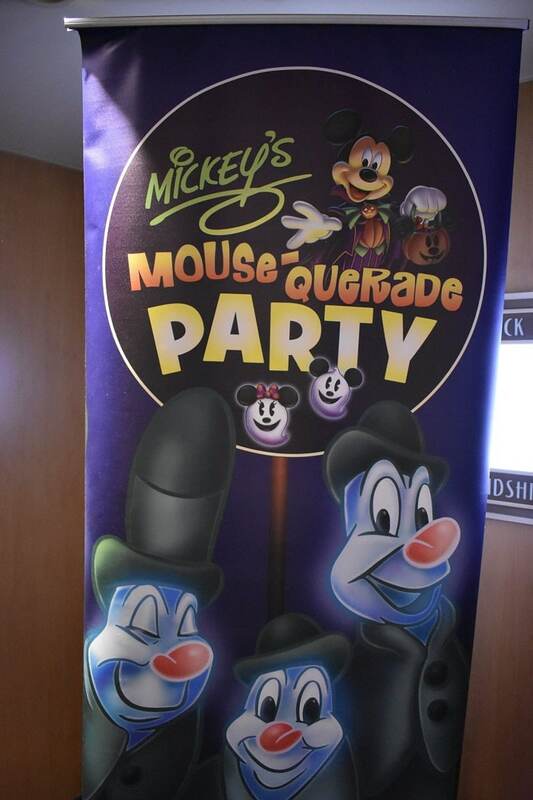 Mickey’s Halloween Party tickets start at $95 for this after-hours party and prices also vary depending on the night. Parties are on select nights in September and October. If you decide to skip the party tickets, not to worry! There is still plenty of Disney Halloween fun over Disney California Adventure Park with decorations, festive music, and a few ride overlays. But the big celebration is in Cars Land! 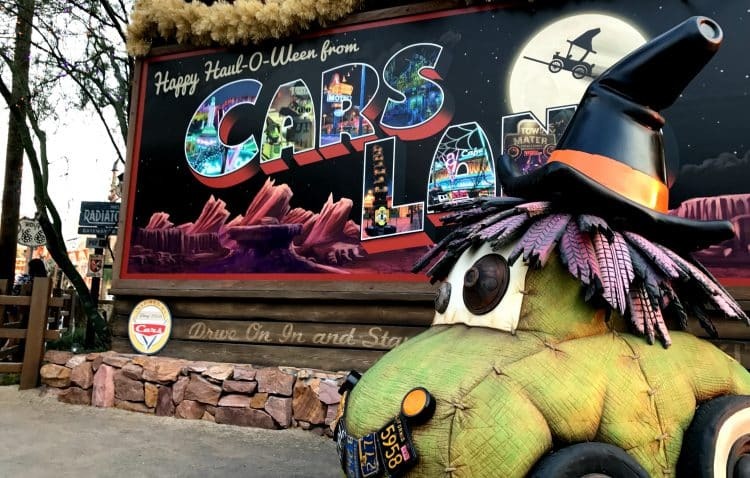 You won’t want to miss Haul-O-Ween in Cars Land where even the cars dress up for the occasion! Make sure to take your time and bring your camera because this is probably the prettiest land in ALL the Disney parks. And you won’t want to miss the yummy and adorable food at Flo’s V8 Cafe! 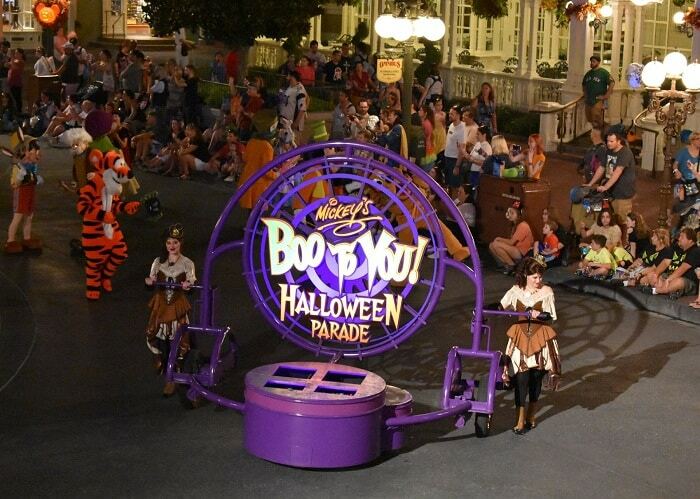 Haul-O-Ween is included with the cost of your ticket to Disney California Adventure Park. Enjoy! 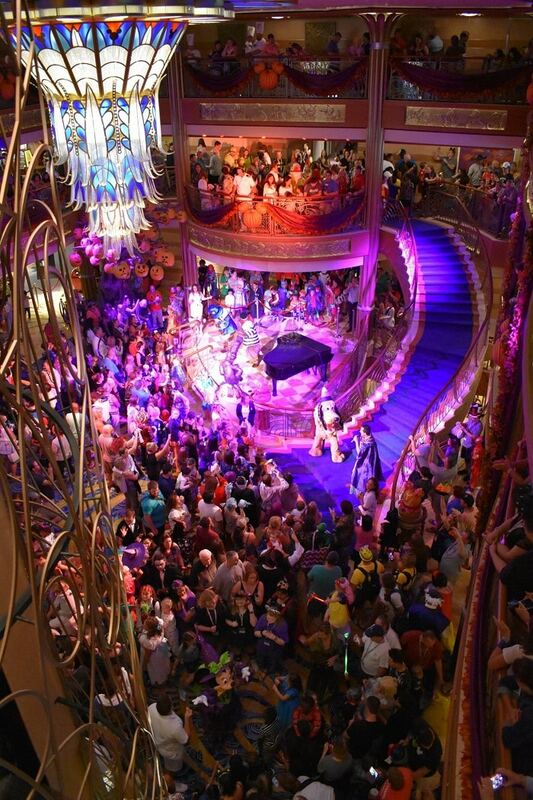 If your Disney Halloween adventures can’t be contained to dry land, you’re in luck because Disney Cruise Line offers the best Halloween party on the high seas! 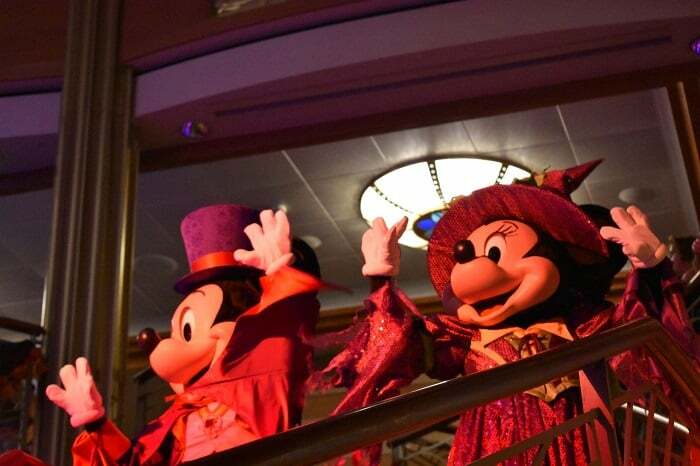 On select sailing dates in September and October, all four Disney ships transform into Halloween central with decorations, special parties, trick-or-treating and other activities. If you’ve never been on a Disney cruise, I can’t recommend them enough. And Halloween is a great time to check them out. 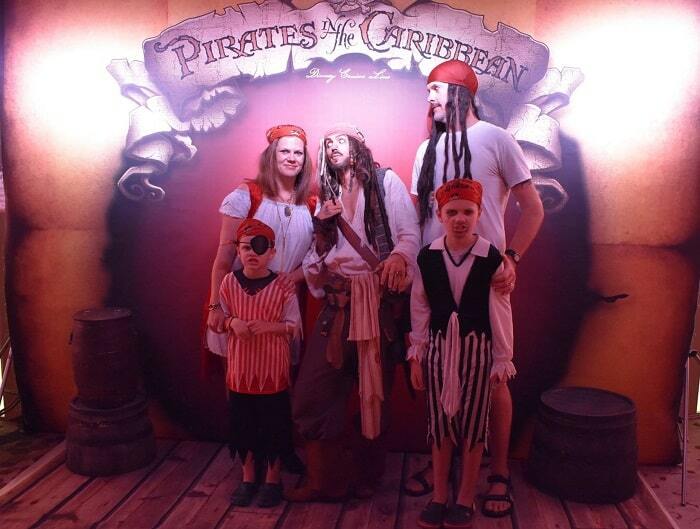 Not only will you have the opportunity to dress up with your family on Pirate Night (which is on all Disney cruises all year long), Halloween on the High Seas also adds a party where you can dress in Halloween costumes and trick-or-treat while your favorite characters appear in costume and do a fun show. Typically the Halloween party takes place outdoors on one of the upper decks, but in case of rain like when we sailed the party must go on! Of course Disney has a rain plan and the whole operation was moved indoors at the last minute. I don’t think my kids minded at all. They still got loads of candy and had a great time! If you’re like me and love dressing up on Pirate night, I think Halloween on the High Seas is an awesome way to keep the costume fun going. And don’t worry if your kids aren’t with you. There’s a party just for adults to show off their awesome costumes as well! Last year, the most amazing Mama Odie was there and I wish I had taken a photo. She was awesome! 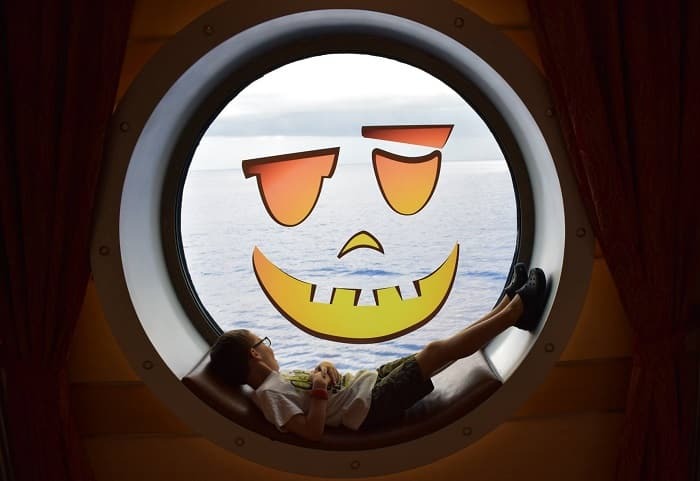 Disney Halloween on the High Seas cruises also have activities like crafts, spooky stories and an extra special screening of The Nightmare Before Christmas “Scream Along” with a Jack and Sally character meet and greet after the movie. 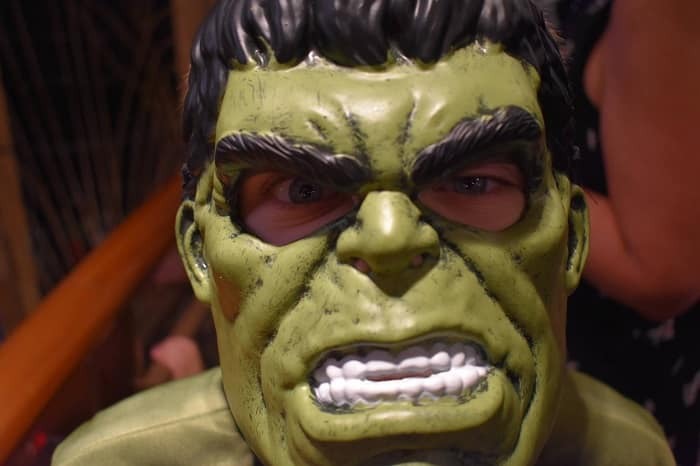 Whether you’re looking for Disney Halloween costumes for your kids, adults or even a Disney family costume, the creativity Disney fans have is unmatched. Honestly, costume-spotting at parties is probably one of my favorite things to do. I’ve seen Star Wars and Marvel characters, entire Pixar ensembles, ride vehicle costumes and even a few Cast Member cosplays. Disney Halloween costumes are nothing but FUN and that’s why I love them. Pajamas make awesome costumes for kids. 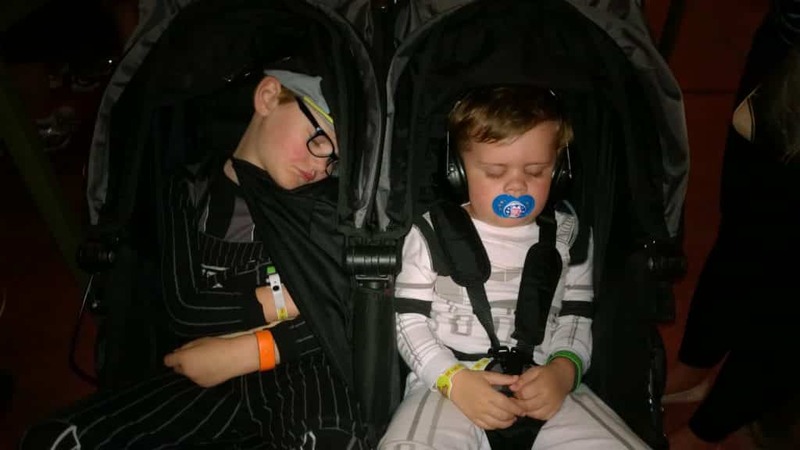 They are comfortable to wear all over the parks but then when they pass out at the end of the night you don’t have to change them! My boys rocked our Star Wars family costume in their PJs all night long. Party PJs for the win! 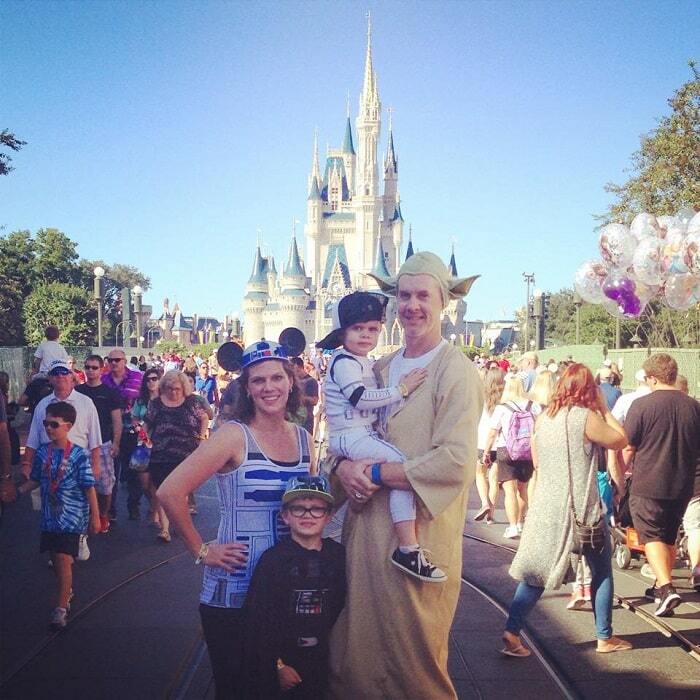 Disney family costumes are fun to brainstorm and usually easy to pull together. 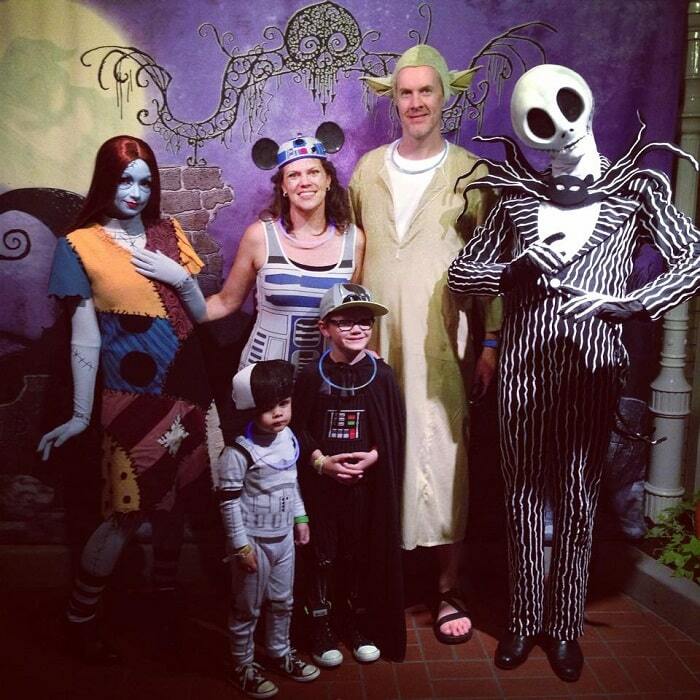 Whether you go with a theme like Star Wars or Inside Out or find a family like Thor and his parents, there is something for everyone! 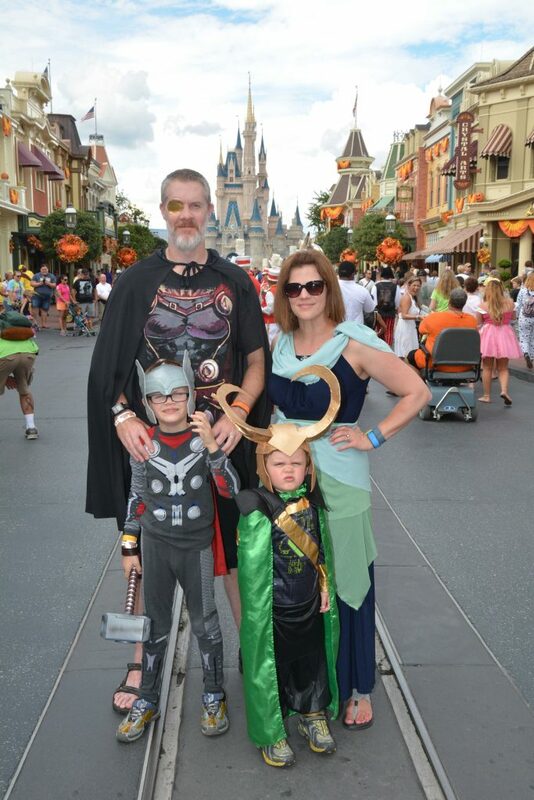 We went as Marvel royalty one year and our costumes were a combination of Amazon purchases, DIY and yes pajamas! The trickiest part was making a Loki helmet, which I couldn’t find anywhere at the time. I love how it turned out and we got stopped by admirers all night. The Loki costume itself was a modified ninja costume that had the right colors. Get creative! But if you don’t want to deal with costumes, that’s ok too! 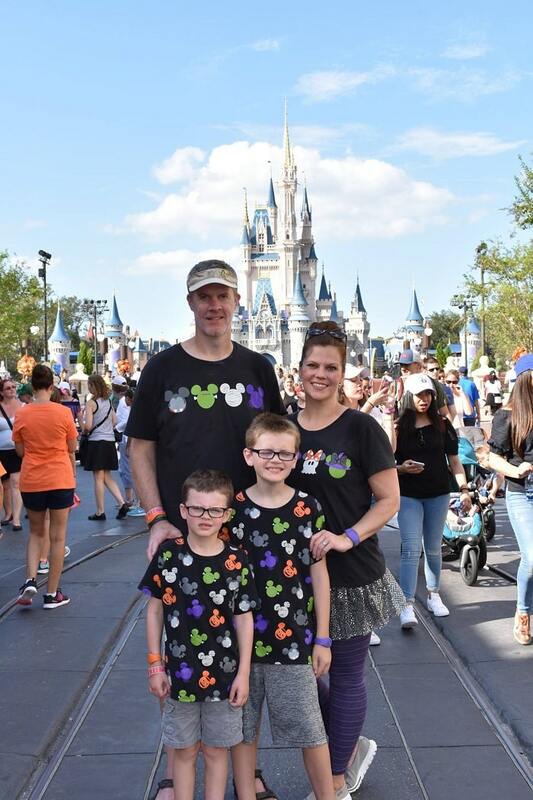 We attended the Halloween party the night before our cruise and knowing we had costumes for that, we decided to go easy at Magic Kingdom and got coordinating shirts. You can make your own Disney shirts or check out what’s new at the Disney Store or the shopParks app. A note on costume guidelines. If you party in Disney Parks, you won’t be able to have any masks that cover your face so plan accordingly. 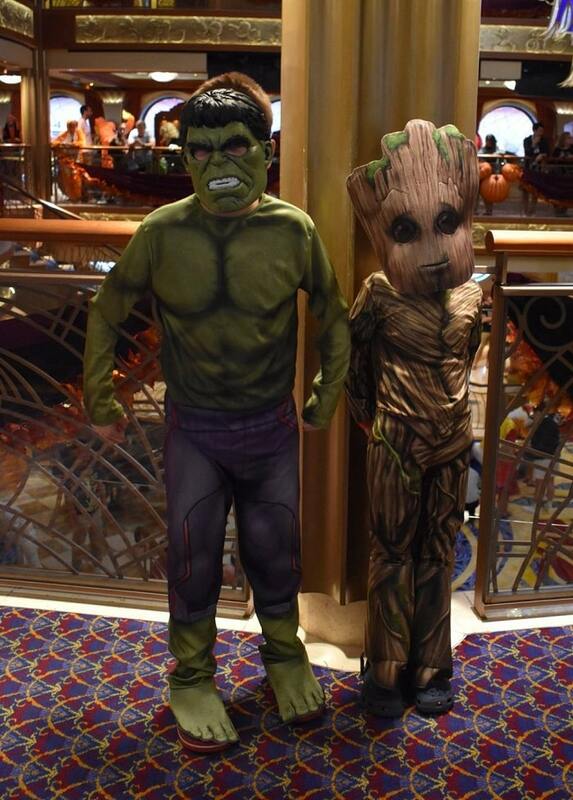 That said, if you plan to trick-or-treat on a Disney cruise, you are allowed to wear a mask so bring all the Groots and Hulks and General Ackbars your heart desires! Whether you celebrate in the parks, at sea or at home, one of my favorite way to bring a little Disney fun into any holiday is with decorations! And there are so many ways to add little touches here and there without breaking the bank. One of my favorite places to shop for Disney Halloween decorations is actually Walgreens. They get a surprising amount of Disney gear at the holidays and it’s usually really cute! 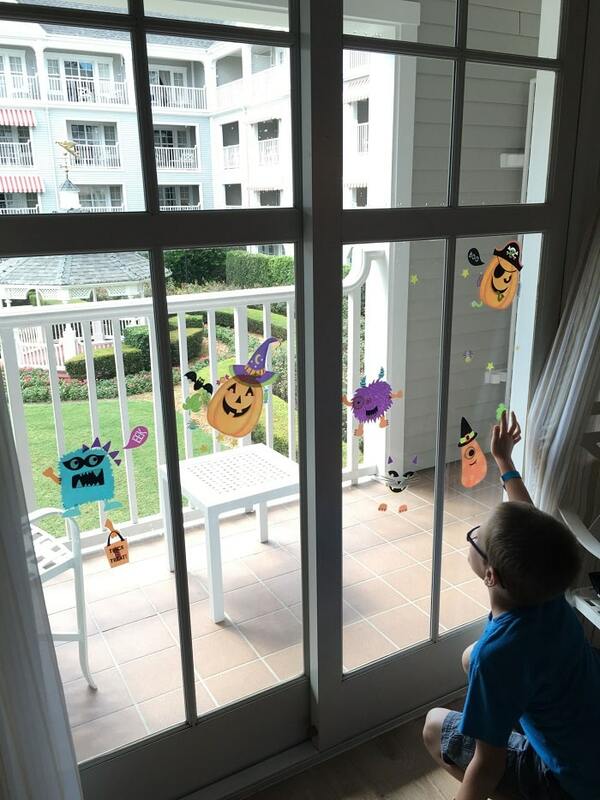 At home or in a Disney Resort Hotel, we also love to grab some holiday window cling decals from the Dollar Tree. They always have general holidays and many times they also have Disney themes! These are great because window clings don’t damage anything and the kids love them. 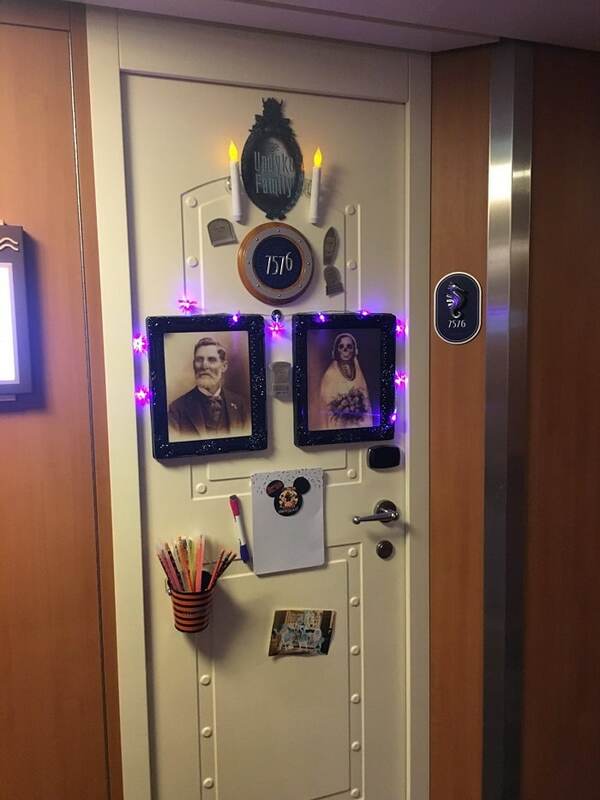 If you’re planning to go on a Disney cruise, it’s so much fun to decorate your stateroom door! With the exception of concierge level, all the doors on a Disney cruise are magnetic and people get really creative. Seriously there are entire etsy shops dedicated to cruise door decorations. On our Halloween cruise, I decided to decorate with a Haunted Mansion theme. I had our name plaque customized on etsy and then laminated it so I could add magnets. I can’t find the shop I used but here is a similar one. I found the amazing lenticular bride and groom photos at Michaels (they change from normal to skeleton!) and printed out photos of the headstones and hitchhiking ghosts from the attraction. It was so easy and we loved seeing our door every time we came back to the room. Plus, we knew exactly which one was ours! Other great places to shop for Disney Halloween decorations are Target, Lowes, Walmart, and of course the Disney Store. If you love watching something spooky but not too scary, Disney Halloween movies are the perfect fit. 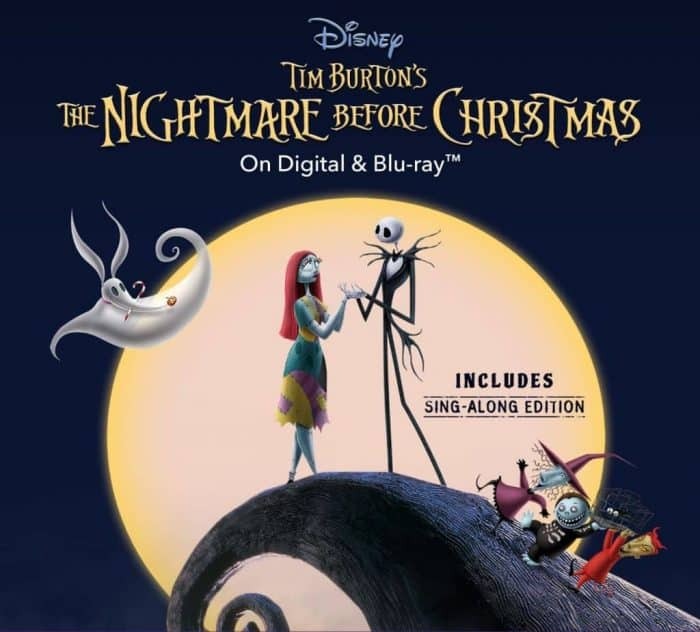 There are some really fun classics to get you in the holiday spirit! The first one that comes to mind is The Nightmare Before Christmas (which CAN be a little spooky for the little ones). And yes it will be hard not to sing along as you watch this one! 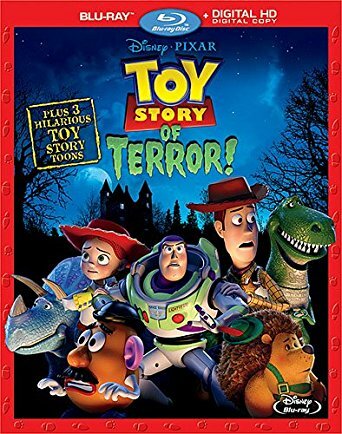 Toy Story of Terror is a fun little short that had us all interested. I don’t know about you but I never get tired of this gang! And don’t forget the snacks! Make these Mickey Mouse pumpkin cookies to go along with your not-so-scary movie night! For the bigger kids, Hocus Pocus and Maleficent might impress. And if you happen to be at Walt Disney World in the fall, you won’t want to miss a special screening of Return to Sleepy Hollow at Fort Wilderness. 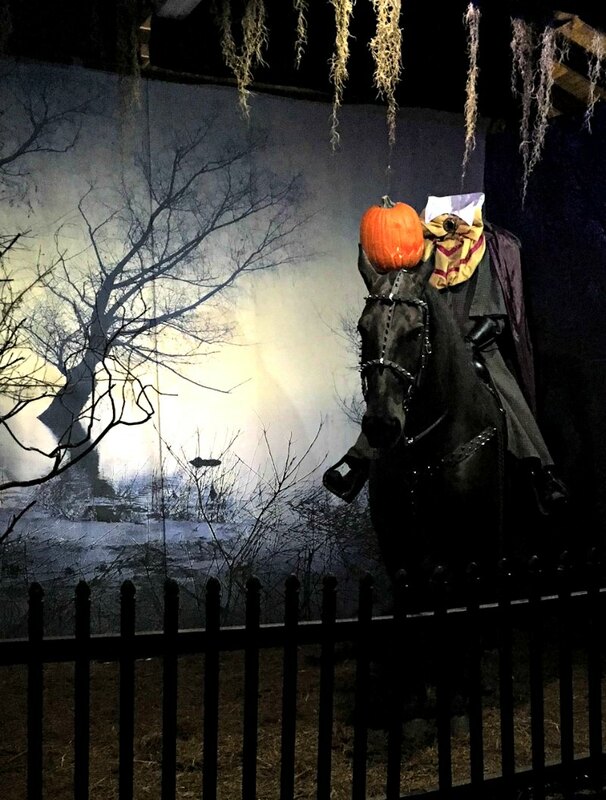 You’ll even have a chance to meet the real Headless Horseman after the movie! 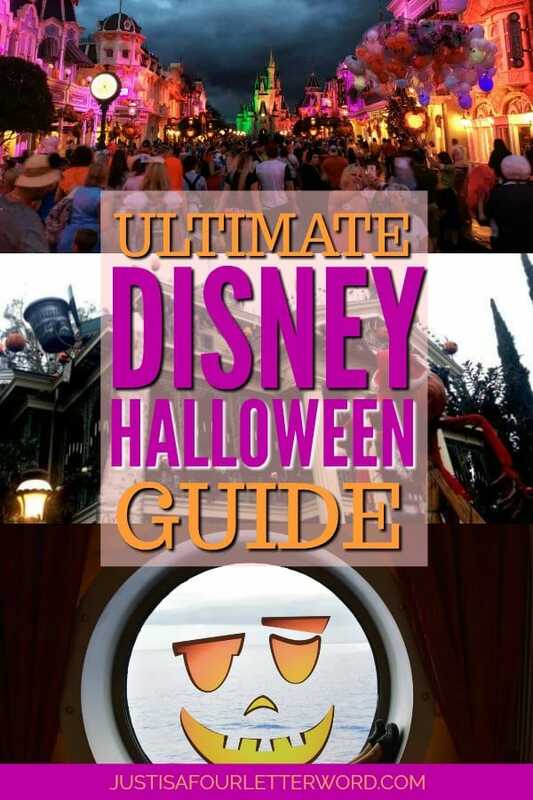 Oh I did say this was the ultimate Disney Halloween guide, didn’t I? We can’t leave out the books! From picture books to chapter books, you can keep the fun going and sit in a cozy chair all night. 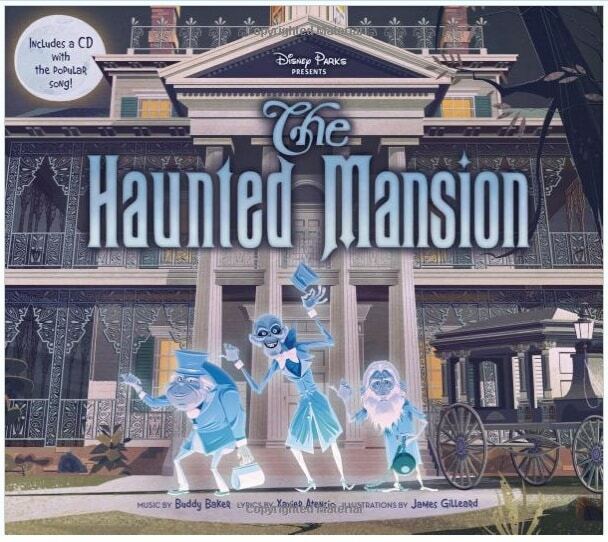 I love this Haunted Mansion picture book that comes with the attraction song. It’s probably one of my favorite Disney songs of all time, regardless of the holiday. And the book is SO pretty. 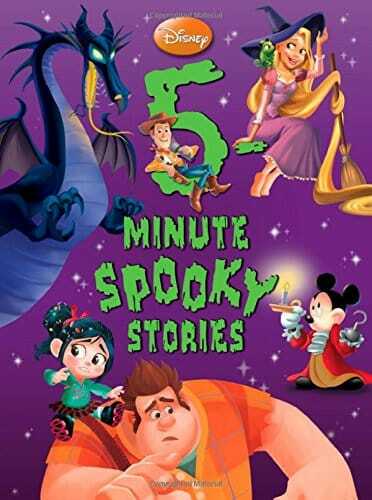 There is also a collection of 5-minute Spooky Stories that features lots of Disney characters. I love this book because it’s really heavy and good quality with nice full color pages. If you’re looking for chapter books, you won’t want to miss the Kingdom Keepers series from Ridley Pearson. These aren’t necessarily Halloween books, but they all feature mysterious villains and puzzles to solve throughout Walt Disney World. Great for any fan! Finally, there is a new(ish) series from Serena Valentino that you may enjoy. 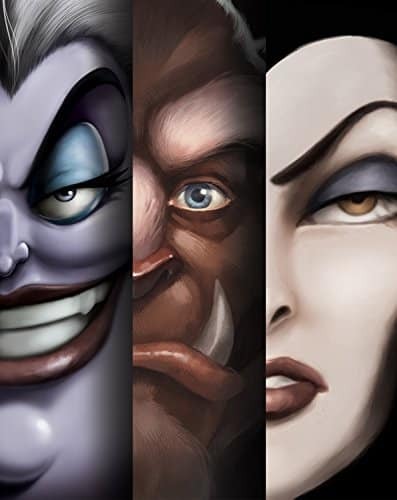 The Villains series explores classic stories from the villain’s perspective. Who doesn’t love a good classic turned upside down? Whew! I think after all this Halloween fun, I might need a snack, but I’ll save that for another post. I don’t know about you but I am ready to celebrate! Happy Disney Halloween!